There are three essential accessories that every man should have in his wardrobe – an elegant tie that can go with several outfits, a well-made leather belt, and a stylish wristwatch. 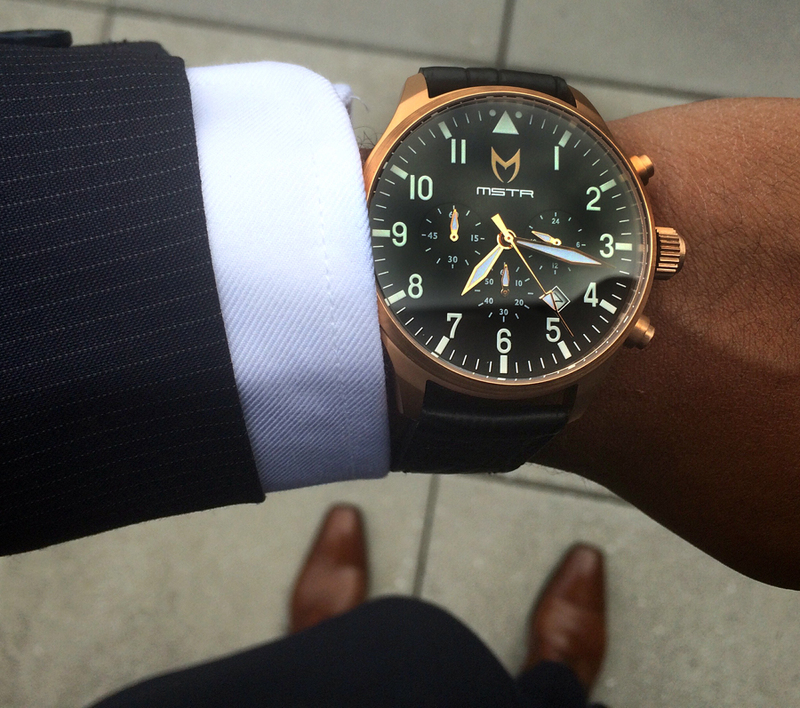 With the Meister Rose Gold Aviator watch you will have two out of the three covered. Meister, or MSTR as it’s known on the streets, is a leader in trendsetting watch designs with state-of-the-art quality, and craftsmanship. Their watches are both functional and fashionable. I wore the rose gold aviator watch exclusively for six weeks straight to get a feel for it’s style, durability, and accuracy, and I’m pleased to say that it did not disappoint in any area. The MSTR Rose Gold Aviator watch is a beautiful watch that was inspired by traditional aviation timepieces with an MSTR twist. Designed true to a pilot’s preference, it’s chic design features bold numbers, a traditional triangular marker, and a six-hand chronograph movement. What initially attracted me to this watch was the color scheme. 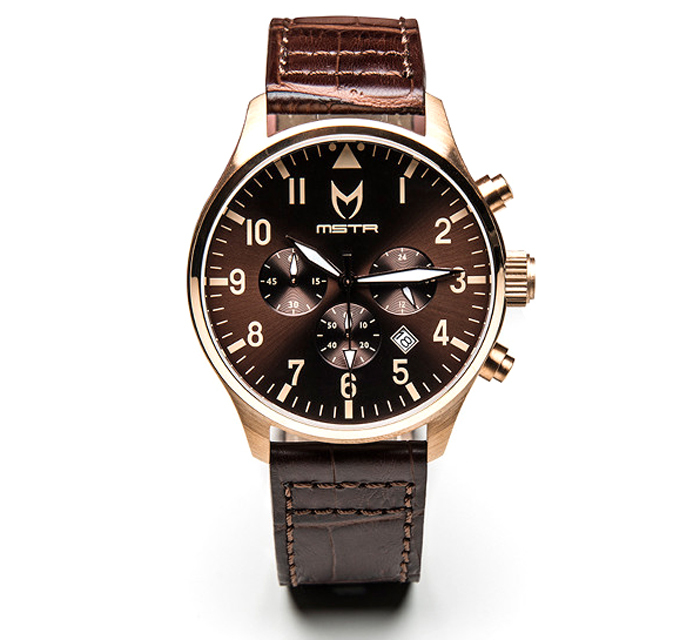 The MSTR Aviator watch has a rose gold PVD coated stainless steel casing and flaunts a brown crocodile style leather band. During the time I tested the watch I wore it in two of America’s most fashionable cities – Los Angeles and New York. In both cities, I received several compliments (one guy in New York offered to buy it off my wrist – at least I hope he was trying to buy it). The watch looks elegant, luxurious, and more pricey than it’s actual cost of $265. This watch looks good with any outfit and will give you an extra touch of class every time to place it on your wrist. One complaint that I have with some watches that look good is that they cannot withstand everyday wear and tear. I don’t handle my watches with kid’s gloves. I’m quite hard on watches. I wear them while working out at the gym, playing in the backyard with my sons, sleeping, or attending a local gala. The MSTR Aviator withstood all of these things and more. In fact, it proved to be more durable than my iPhone. Let me explain. One day while working in the yard, I removed my watch because I didn’t want any gas to splash on it while I was fueling my lawnmower. As I unfastened the strap, the watch slipped off my wrist and fell approximately 3 feet to the pavement. I feared that the glass would be cracked or that the watch’s internal mechanisms would be damaged. I was pleasantly surprised that the watch withstood the drop without a single scratch. My iPhone, on the other hand, was not as fortunate. I dropped it from the same height and it was ruined. Even though I had a case on it, the phone’s screen cracked and it ceased to function properly. Although I don’t recommend dropping your MSTR Aviator, you can feel secure that it is built to last. The most important test of a watch is it’s accuracy. I regularly synchronize my watches with the Official NIST US Time to make sure that they are keeping time properly. During my six week test of the MSTR Aviator, the watch didn’t gain or lose any time. Of course, six week really isn;t enough time to fully test a watch’s accuracy, but I was satisfied with the MSTR Aviator’s ability to keep me on schedule.